I discovered Slugdge through a Bandcamp tag dive. I clicked on their second album, Gastronomicon, which features painted album art of a slug, expecting a laugh. I did not expect a band whose musical prowess is directly proportional to the ridiculousness of their chosen subject matter. After signing to Willowtip they released a reverse chronologically organized compilation of their three albums, called The Cosmic Cornucopia for 1$! 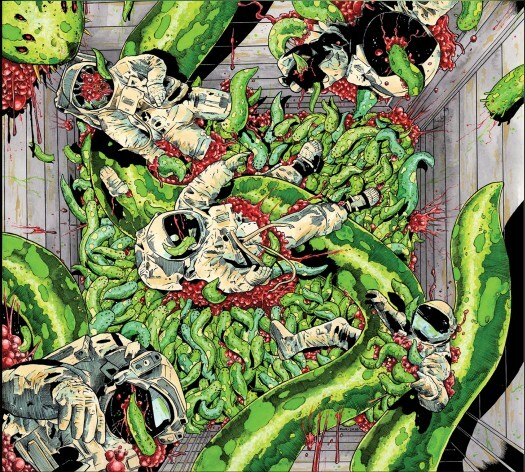 Each Slugdge album is about space slugs enslaving humanity and features gems of track titles like "Lettuce Prey", and "The Sound of Mucus", and “Salters of Madness”. Though it's an hilarious concept that's actually super metal it's ironically not far removed from serious metal about Cthulhu, Lucifer or really any malevolent entity bent on humanity’s enslavement of destruction. Though song titles are rife with references to classic metal and wordplay the delivery is dead serious. Play Slugdge, out of context, for a friend and it's unlikely they'll detect any hint of parody. Musically the band is also a strange mix of orthodox unorthodoxy; they combine buzzsaw distortion and extremely low tuned guitars with a mix (both musically and vocally) of Mastodon and black/death metal; like Entombed covering Mastodon on 8-string guitars. Allusions to other bands sell Slugdge short, though. They sound both like and unlike any other band. The riffs are killer, the leads are great, and the vocals are excellent. The whole catalog, experienced all together is remarkably cohesive. It doesn't sound like a series of three separate albums but one giant space slug of an album. I never heard these folks before but jumped at this deal. I'm really surprised i never heard their name tossed around because this band is really good!